Amm panna concentrate in the fridge that you just use a couple of tablespoons for a glass of chilled water ans stir instantly. What bliss in this scorching summer. Kachhe aam ka panna is something we are chugging in large amounts every single day. Delhi is so hot that it is essential to have a glass of aam panna first when you come back after a walk outside or just after a household chore. The heat drains all energy and even watering the plants in the garden looks like a humongous task. Chilled aam panna instead of water several times a day is keeping me sane. Especially when I have a tendency to get migraines in this heat, however cool the indoors are, the harsh sun makes a strong trigger for most migraine affected people. Keep hydrating yourself and keep having electrolytes all the time I would suggest. Amm panna works really well. Though I have been on almost a fruit juice type diet most days, watermelon, Bael ka sharbat, smoothies and Jamun, phlasa and cherries are making my food, consumed throughout the day. I have been missing from the blogs for some time. Too much heat, too much work and other engagements kept me on my toes. I was nursing my migraine when I was not working so it has been a difficult time. Detailed meals are not happening although I kept planning for something or the other. Lighter meals with ridge gourd, lauki, turai etc is feeling good, the seasons make such an impact on our system our tastes change. Having said that, I think that happens when you listen to your body and not eat mechanically the things you are exposed to. Like the latest sweet mango drink that comes out of a plastic bottle or the ice cream that pops out of the glossy pages and you dial a number to order a jumbo pack for the family. Jumbo pack because it was 25% extra in the jumbo pack. Don't listen to the advertiser I say, it's always better to listen to your body. Anyways, aam ka panna was posted long back on the health food blog but a reader recently asked for an aam panna concentrate so I thought why not share it in detail as I am making it every single day this season anyways. I took some pictures and updated the pictures on the older post on summer coolers as well. A preservative free and coloring agent free is not a difficult thing. Here is how you do that. Cut into halves or quarters and boil 2 large raw mangoes with a cup of water in pressure cooker till soft and mushy. Two whistles is enough to cook the raw mangoes thoroughly. Let them cool, separate the stones and skin and pulp the flesh. What I normally do, I taste the boiled skin of the mango too, if it is not too bitter I pulp the skin as well. 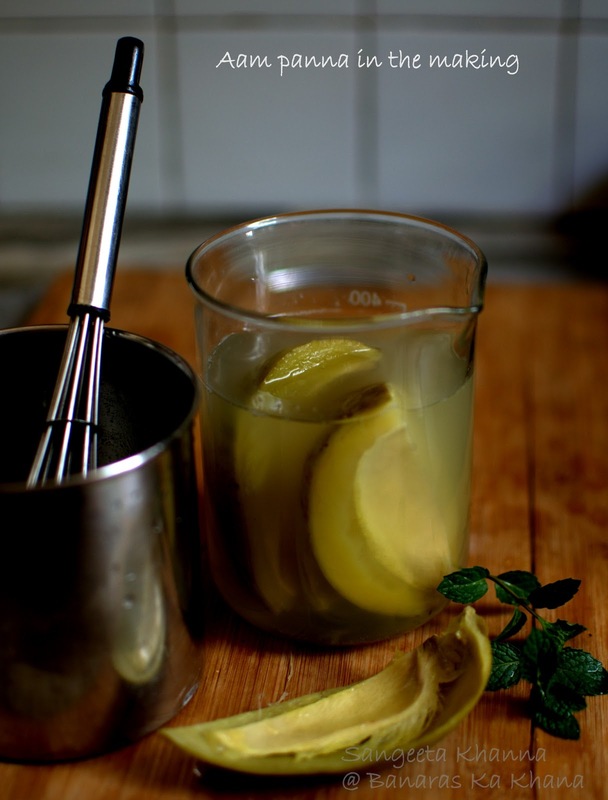 The skin to quite rich in minerals and adds to the electrolyte content of the drink. To make the process hassle free, I add mint powder, pink salt (kala namak), roasted cumin powder and a hint of asafoetida sometimes. Everything to taste and to mood. No water is added and a thick paste is made and filled into a jar, to be refrigerated for a week. 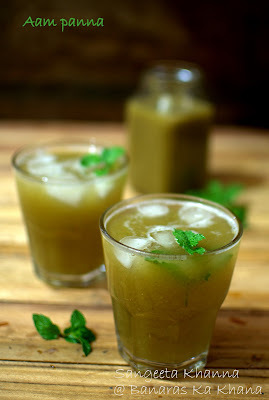 Just 2 tbsp from this concentrate and a glass full of ice cubes and water is what you need to stir a refreshing aam panna every time you need it. So boil as many raw mangoes as you need and keep a jar of this concentrate ready. Those reconstituted powders are not worth wasting your energy, or your money when a real natural cooling drink is at your fingertips. Use fresh mint leaves if you feel like. I generally end up using a good quality mint powder, either home dried or from a brand called Raunak which is really good. Fresh leaves are used for garnish as the leaves are always there in the garden. 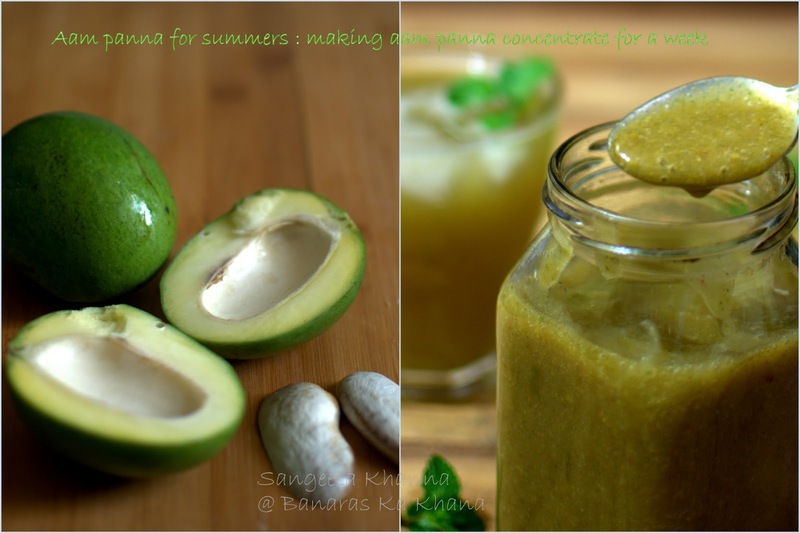 There is no excuse to not make aam panna everyday now. Go get some raw mangoes and boil them. I often keep the boiled mangoes in the fridge too and just squeeze the pulp, mix the powders and whisk it all to make aam panna which has tiny bits of mango pulp floating around. I like it this way too. 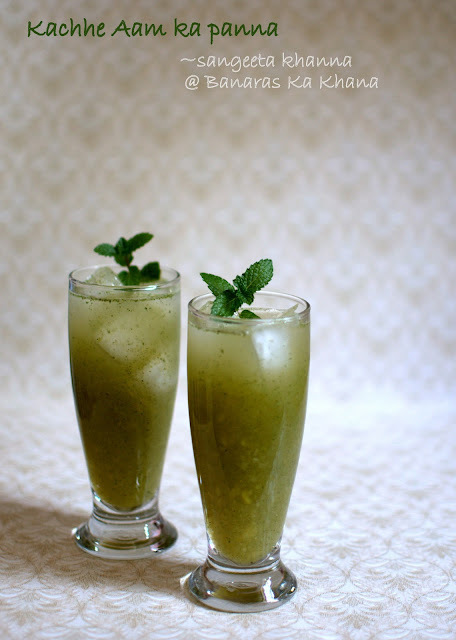 Actually you wont bother with the texture much if the taste is so refreshing and the drink is so instantly cooling. We say taravat aa gayi in Hindi. Add a hint of sugar if you like it sweeter, but I would suggest having it in the savory avatar if you have to drink it several times a day. Like I do. It has been my life saver every summer. Hi Sangeeta! I don't think I have commented before, mainly been a lurker. 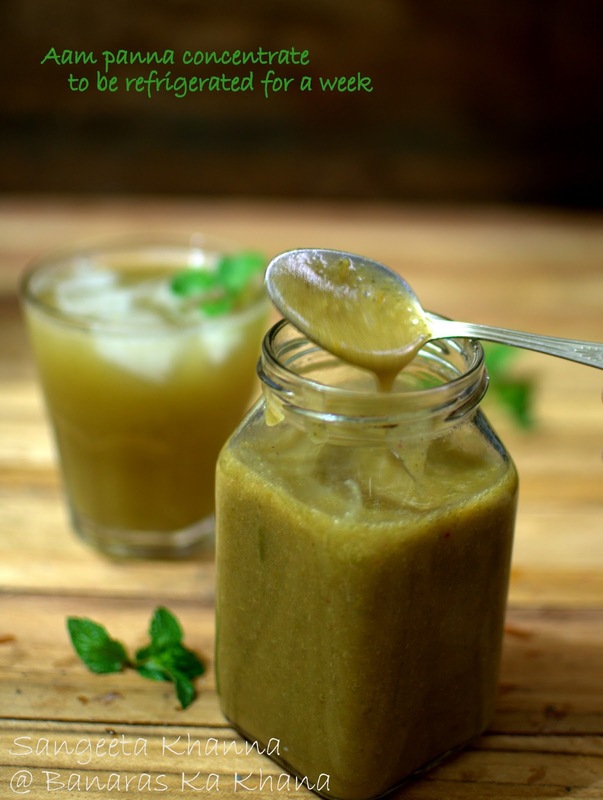 You have the most amazing recipes and aam ka panna happens to be my absolute favorite drink. I am going to make this concentrate soon, do you think this freeze well? PS: Your aloo gobhi ka nimona. kaale chane, parwal ki bhujiya a couple of chutney recipes and the everyday masala are a regular in my kitchen. Thanks for sharing all your recipes. The Panna looks very tempting. Loved the perfect green colour. Oh the panna looks so good Sangeeta. I miss kacche aam. I do this too. Make the concentrate and it lasts me for almost two weeks. Very elegant pictures.. awesome ! !